Would you be ready in 13 minutes? These violently rotating columns of air usually only last a few minutes, but they can be catastrophic events, lasting for more than an hour and traveling dozens of miles. Most of the world’s tornadoes occur in the United States and usually these natural hazards occur between April and June. Exactly how and why tornadoes form is not completely understood. What is known is that most result from supercell thunderstorms. These severe thunderstorms have persistent updrafts that can reach speeds of 100 mph. Within the storm, a strong vertical wind shear causes a horizontally rotating cylinder of air. The updraft lifts the rotating cylinder within the supercell. The rotating cylinder of air narrows, becoming stretched, and spins faster and faster forming a tornado. The rotation within the thunderstorm gives the supercell its classic "hook" appearance which can be seen on radar. (More information on tornado formation). These natural hazards have significant impacts on human activities and communities. Each year about 56 people are killed by tornadoes. 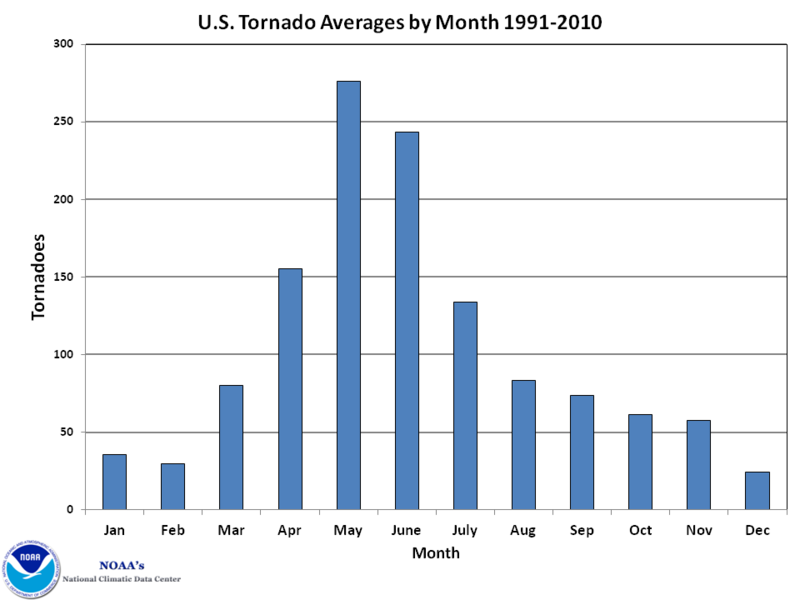 However, the spring of 2011 was one of the deadliest and costliest tornado seasons on record. Between April and June 2011 tornadoes killed more than 580 people and caused over $21 billion dollars in economic damages. The high death toll was partly a result of the tornadoes traveling rapidly through heavily populated areas, a lack of adequate storm shelters and individuals who did not quickly seek shelter. Multiple methods are used to reduce the risks from these natural disasters but preparation is still the key element of survival. Your first line of defense is to be weather-wise by being aware of weather forecasts, warnings and watches. Plan ahead, thinking of where you can seek shelter should a tornado approach. For generations, families in regions with significant numbers of tornadoes have built storm cellars where they can take shelter if a tornado occurs. New construction techniques are being developed to make buildings more resistant to strong winds but most people still live in homes which offer limited protection. The addition of self-contained “safe rooms” to these buildings has saved multiple lives. Since the first tornado forecast rules were established in 1884 tornado research has continued to advance. With the development and use of sophisticated observations, technical equipmentoffsite link, data analysis and computer modeling the National Weather Service and others seek to improve our understandingoffsite link of the causes of these storms. Warning systems are continually being evaluated and improved to utilize new research findings and technologies. Tornadoes can be an excellent topic with which to engage students in meteorological processes. Educators can use the resources in this collection to develop lessons and activities to help students investigate the impacts of natural hazards and other Earth processes on humans. These are some of the topics described in the Next Generation Science Standardsoffsite link and many state science standards.